Chicken fingers, or chicken tenders as they are sometimes called, are a favorite of young and old. If you are looking for kid friendly recipes your kids will actually eat, you have hit the jackpot. Any way you serve them, we have two great recipes here for you today, one with the addition of Parmesan cheese, a tasty ingredient to add to any meat breading. Combine the crumbs and seasoning. Cut the chicken into bite size pieces. Brush the chicken pieces with oil and coat with the crumb mixture. Place on a foil lined baking sheet. Bake for 10-12 minutes, turning once. To reheat, bake for 10 minutes. If you want to freeze them, under bake slightly, cool and freeze. When ready to serve, bake from frozen at 350°F for about 20 minutes. Spice it up the way you like it. Want a bit of heat? Add cayenne pepper to the dry ingredients, a pinch for a touch of heat, more if you like it spicy. Or, add some hot sauce to the egg mixture. Vary the herbs and spices to suit your taste. We have given you a few great combinations here, but if you don’t think the kids will like basil and oregano, just leave them out. They will be a bit less tasty to some of the adults but the kids will love them. These chicken fingers are so much healthier than other recipes, because they are baked, not fried. Baking them keeps the fabulous flavor but loses most of the oil. Chicken tenders are a perennial children’s favorite. They are also a favorite among the adult crowd, either as an easy dinner recipe, or with a great dip as a party food or easy appetizer recipe. Subscribe to the site here and never miss a great recipe again. 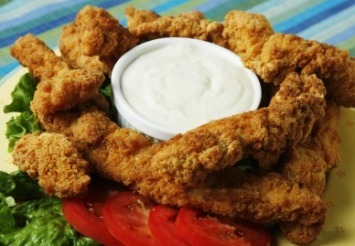 If you love this recipe for chicken fingers, you will want to have a look at our other delicious chicken recipes here.